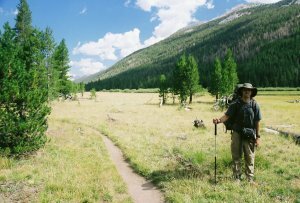 My big trip for 2007 had to be the through-hike of the John Muir Trail. 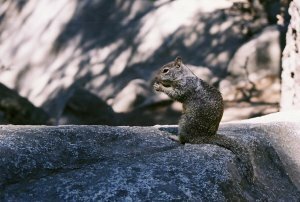 This trail runs from the Happy Isles visitor center in the Yosemite Village to Mount Whitney, the tallest peak in the continental United States. 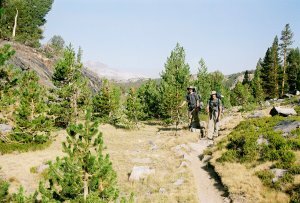 Along its 211 miles, the trail crosses through some of the most beautiful alpine landscape. But the journey doesn't end at the summit of Mt. Whitney. 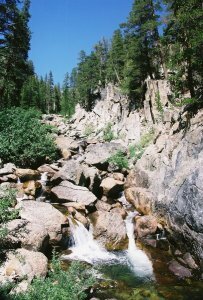 From there, it is another 11 miles to the nearest trailhead, the Whitney Portal. 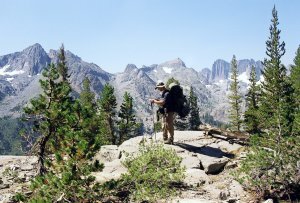 The JMT is hiked in both directions, with the primary factor being one's definition of suffering. 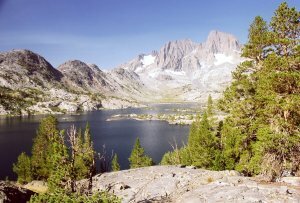 Starting from the south, the trail starts with the climb of Mount Whitney. 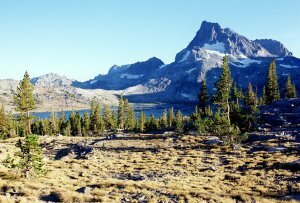 This is no easy task, as the first convenient resupply point, the Muir Trail Ranch is located about a week of hiking away. Thus, it is necessary to carry a backpack containing a week's worth of food. Climbing Whitney is challenging for many even without the 50+ pound backpack. 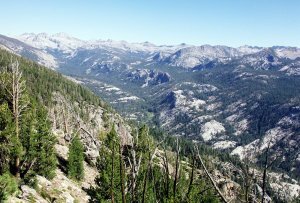 But the advantage of heading north is a gradual elevation loss, as the Yosemite Valley lies some 4000 feet below Whitney Portal. Conversely, by starting in the north, one gradually gains elevation. But, the northern half contains more resupply options, and the gradual elevation gain helps with acclimatization. We, this being Mike N., Garrett and I, decided on the north-to-south option. 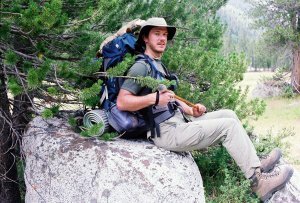 Although some people have hiked the entire trail in less than a week (the record is something crazy like 4 days), most people take around 18 days to complete the journey. Our plan called for 16 days with another day built in for a possible rest day. This meant we had to replenish our food at least once. 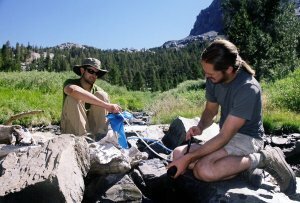 The guide books to JMT list a variety of resupply options, but of these all but three require hiking out for a considerable distance (or bribing somebody to hike-in with the extra food). 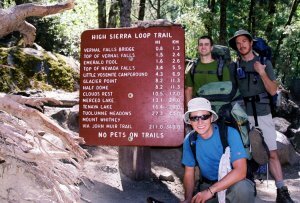 The remaining three spots are ranches located near the trail that allow hikers to mail in their food stash for a small holding fee. The northern-most of these is Red's Meadow. 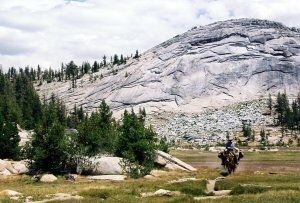 The next one is the Vermillion Valley Resort, which is followed shortly by the Muir Trail Ranch. We decided to send in two shipments, one to Red's Meadow and one to the MTR. This meant that we started with a 4-day supply of food, which was followed by a 5-day stash waiting at Red's Meadow. Then, from MTR, it was 8 days without a resupply. This last stretch pushed not only our backs, but also our creativity, since all that food had to fit into a single bear canister! Start! That's me in the front, with Mike and Garrett in the back. 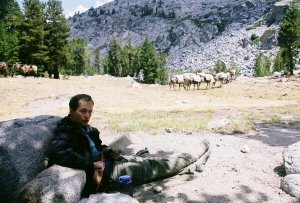 As I had never been on a backpacking trip this long, it was quite daunting to figure out what to eat. I got my overnight backpacking routine quite down, but I knew I didn't want to eat oatmeal, tuna and Lipton noodles for 17 days in a row. So, I searched around, and eventually came up with a fairly decent menu. The breakfasts consisted of oatmeal or grits mixed with a variety of dried fruits (bananas, blueberries, strawberries and so on). Alternatively, I made scrambled eggs with hashbrowns. Powdered eggs don't taste very well eaten alone, but they are quite tasty combined with potatoes. Lunch was cheese (smoked gouda, holds really well) or honey or peanut butter, all eaten with a tortilla. I also carried a bag of home-made trail mix on which I snacked during the day. Then finally, dinners were the cream of my creativity: pasta with peanut butter, jambalaya, chicken noodle soup with potato dumplings, rice with mushrooms, or the standard Lipton beef stroganoff. These were usually followed by a desert: chocolate pudding, cheesecake, or cookies. I carried cappuccino powder for the morning kick, and gunpowder tea to have with dinner. And I also brought along a leather bota, filled with a bottle of cheap Cabarnet. Who says you can't eat well in the backcountry?! Now about the ferret. A friend of ours from work, Kooj, is quite obsessed with stuffed animals and his car looks like it's off on a delivery to a toy store. His most prized possession is the ferret. Another friend, Julien, thought it would be funny to steal the ferret and post notes saying the ferret was kidnapped and won't be released until Kooj eats a whole donut (Kooj is also quite obsessed with diet and exercise). Hearing of the ferret's capture gave me the idea to take him on the hike, sort of Amelie style. And so he came along and turned out to be quite a good conversation starter. The funniest thing is that Kooj never suspected any of us in the ferret's disappearance! 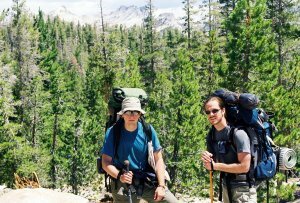 We planned on arriving at Yosemite in the late afternoon the day prior to the hike. Unfortunately, the Air Force managed to screw us once again. Jared, who was supposed to join us on the hike (our final party of 3 was the remnant of a 6-member team), and had to bail due to some military obligation, got stuck on base doing a military exercise. We thus didn't leave Lancaster until 8 pm and didn't get to the park until after 2 o'clock in the morning. This didn't leave much time for sleep. We ended up with a pretty late departure from the campsite. Then, Garrett forgot his camera at the permit office, and we didn't end up hitting the trail until 11am. The starting elevation was 4035 feet. 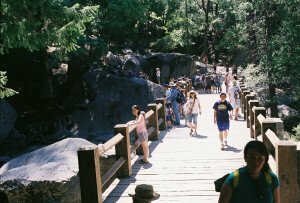 The trail was full of people, at least until we got past the junction with Half Dome. It was pretty smooth, although quite steep. We wanted to get to the Sunrise Camp, but it was getting dark with us still having few miles and a thousand feet of elevation to go. We were quite exhausted. 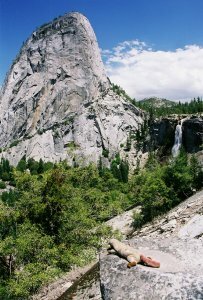 The hike out of Yosemite Valley is quite brutal, as the valley is located almost 6000 feet below Sunruse. We thus camped at the start of the final steep section before Sunrise, at the 8600' contour line. 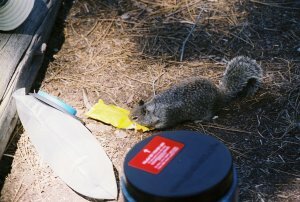 I came back from pumping water to see a squirrel eating Garrett's M&Ms. What was I to do besides take a picture and wait for it to come back for more? The sky looked clear that night, and we left the rainflies off. But clouds did roll in, and at about 2am it started sprinkling. Mike got up to put the rainfly on his tent, and saw a pair of eyes. I woke up to Mike and Garrett shouting "Bear! Bear!" which was soon followed by "Oh, that was just a deer." Oops! We wanted to catch up today, but we again didn't hit the trail until 11am. Going over Cathedral Pass was pretty easy. Garrett and I went for a quick swim in the lake. 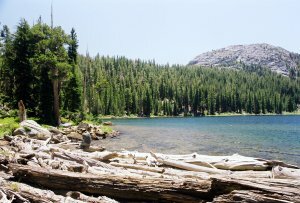 It was quite nice - pretty much what I expected the JMT to be like: going for a swim every day, relaxing in the sunshine, sipping on wine reading Walden. Little did I know. It was 4:30pm by the time we left the lake, and we still had 11 miles to go before our planned camp site at the 8900' junction. We got only half way through the final 4.2 mile stretch before it got really dark (9:30pm). We found a little clearing away from the trail and pitched the tents there. I was too tired that night to cook dinner and so I just snacked on the trail mix and went to bed. Here we are somewhere around Sunrise. Later we encountered our first horse train. Things started looking up today, since we managed to leave camp early. 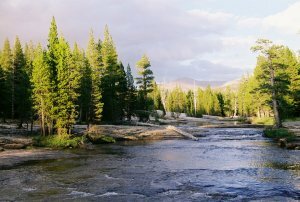 This was partly due to us wanting to avoid an encounter with a ranger, since we were not quite sure if we were completely out of the "no-camping" zone surrounding Tuolumne Meadows. This ended up being another long and tough day. But, we finally caught up, and made it to the 1000 Islands Lake. In fact, we made it past the lake, and camped at a secluded un-named lake just east of Emerald Lake. Still no bears, but we heard the next day from other hikers that camps at the 1000 Islands Lake got raided. Good thing we didn't stay there! Meadow on the way to Donahue Pass. Watch out for those sneaky ferrets! Taking a lunch break in style with a bottle of wine and Walden. This is by the lake below Donahue Pass. Today we hiked through the Evolution Basin, where the Banner Peak and Mount Ritter stood as backdrops to many breathtaking lakes. We arrived at Red's Meadow just in time for dinner. This place was great! I was quite worried that our packages didn't make it, but they all arrived without a problem. Mine was by far the smallest. The food at the cafe was a treat after 3 nights on the trail. I got a cheeseburger with a milkshake. The on-site campground was located about 10 minutes away from the cafe. A lot of through hikers were already camping here, but we managed to squeeze in. We met few folks, including Edward from HI, who saw a bear last night at Ruby Lake. Looks like there were bears to the left and right of us, yet somehow they left us alone at Emerald. Red's Meadow sits on a natural hot spring, which is fed to a shower room. The hot shower was a nice way to end the day. Our original itinerary had us completing the next stretch in 4 days, but since we shipped in an extra day worth of food, we decided to take an advantage of it. Adding the extra day shaved off over 2 miles from our daily distance. We thus ended up with a pretty short day, only 11.5 miles. 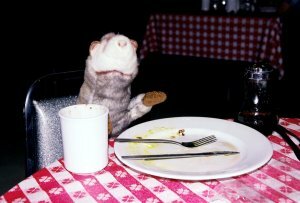 We started the day by grabbing breakfast at the cafe and making sure the ferret got his morning fill. The hike wasn't very eventful. Most of the day was spent in a dense forest, with not much scenery to look at. At one point we passed through a site of an old forest fire. 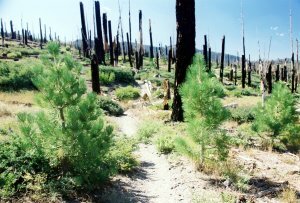 The burned stumps shared the ground with new green pines. It was neat seeing a new forest take place of the old. The only other views came at Red Cones and later between Deer and Duck creeks, where we got a nice look at the Silver Range. Somewhere out there was Silver Pass, the first major mountain pass we had to tackle. We camped at a nice campsite at the crossing with Duck Creek. We did laundry and I accidentaly washed me clean clothes. It was clear that night, but also very cold. The temperature dropped below freezing, and our drying laundry turned into slabs of ice. Today we had another late start - 10:30am! We really need to work on our morning routine. On the upside, I got to make a decent breakfast: hashbrowns with eggs and mushrooms plus a cup of cappuccino on the side. I could get used to this! We hiked by several more lakes including Purple Lake and Lake Virginia. I got to that one about 30 minutes ahead of Mike and Garrett, so I went for a swim. The water was cold, but it felt great. This is a really pretty lake. I need to come back here one day and just bum around on its shore for few days. 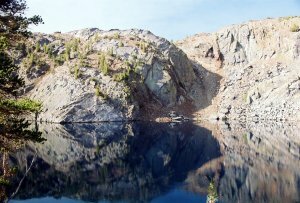 We camped at Squaw Lake, which is located about a mile before Silver Pass. We wanted to make it across the pass today, but that would mean setting camp up after dark. This way we had few hours of sun left for more laundry (I did wash the dirty stuff this time) or go for a dip. This is also where we met the "lawn chairs", a couple in their fifties on an anniversary hike. Both of them had lawn chairs strapped to their backpacks, which I found quite hilarious. 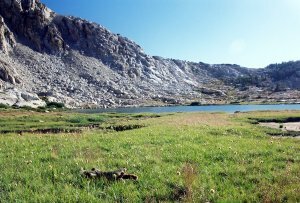 The Squaw Lake is pretty small, and there was only one flat grassy spot by its shore. So, I was quite disappointed to see another hiker (Mr. Lawnchair) already heading for the spot. We exchanged few words, and I told him that he should keep the spot since he was there first. But his response surprised me: "It's a nice spot if you don't mind camping on grass!" We surely didn't mind it, and they camped on rocks instead. Mike went fishing, and caught a trout. We had another clear and cold night, with the temperature dipping below freezing.